Faculty of Pharmacy and Herbal Medicines Research and Education Centre University of Sydney, Building Al5, Sydney NSW 2006. Received May 20, 2006; Revised July 19, 2006; Accepted Aug 3, 2006; Published, September 30, 2006. ABSTRACT: Gynostemma pentaphyllum is a traditional Chinese medicine used for a variety of conditions, including elevated cholesterol. We have examined the pharma-cological anti-hyperlipidemic and hypoglycemic effectiveness of Gynostemma pentaphyllum in the obese Zucker fatty diabetic rat model. After treatment for 4 days Gynostemma pentaphyllum 250 mg/kg reduced triglyceride (33%), total cholesterol, (13%) and low density lipoprotein cholesterol levels (33%). These effects were dose-dependent and maintained for at least 5 weeks. Chronic treatment for 3-5 weeks also reduced post-prandial hypertriglyceridemia induced by olive oil 10 mg/kg in the Zucker fatty rats but had no significant effect in lowering sucrose-induced hyper-glycemia in Sprague-Dawley rats. A novel regulation by Gynostemma of glucose levels was also observed in the Zucker fatty rat model. In a glucose tolerance test in obese and lean Zucker rats pretreatment with Gynostemma pentaphyllum 250 mg/kg demonstrated glucose levels were significantly less 2 hours post challenge (20%) in the Gynostemma pentaphyllum obese rats compared to the control group. Gynostemma pentaphyllum did not significantly reduce glucose levels at 120 min in the lean strain, in contrast to the 20% decrease seen in the obese rat. In vitro, Gynostemma penta-phyllum inhibited α-glucosidase activity (50% inhibition at 42.8), which compared to acarbose (50% at 53.9 µg/mL). The improvement in glucose tolerance at 120 min by Gynostemma pentaphyllum in obese Zucker fatty rats but not lean rats suggests that it may improve insulin receptor sensitivity and together with the significant reduction of hyper-triglyceridemia, cholesterol and low density liporprotein cholesterol suggests that Gynostemma should be examined further by oral hypoglycemic / anti-hyperlipidemic therapy. Gynostemma pentaphylum (GP) has been used traditionally in Chinese medicine for its anti- inflammatory, anti-cancer and cardiovascular properties. It contains more than 90 saponins, including gynosaponins that have been isolated and identified in Asia and suggested to have a variety of pharmacological properties. (Zhou 1988; Zhang et al. 1993). We have previously demonstrated that GP demonstrates anti-inflammatory properties in murine macrophages and anti-hyperlipidemic properties in a polaxamer-P407 induced hyper-lipidemic rat model. (Aktan et al. 2003; Megalli et al. 2005; Huang et al. 2006). In addition we have further identified a novel LXR-a activator (TR1) in GP that selectively enhanced ABCA1 and apoE gene expression (Huang et al. 2005) LXR plays an important role in cholesterol homeostasis. Recently a novel insulin releasing substance, phanoside has also been isolated from GP. (Norberg et al. 2004). Zucker fatty rats have been widely used as a model for obesity studies. Homozygous obese Zucker rats (fa/fa) are characterized by hype-rglycemia, hyperinsulinemia, hyperphagy, glucose intolerance, hypersecretion of insulin after glucose feeding, low glucagon secretion, hyper-triglyceridemia and hypercholesterolemia. In particular, very low density lipoproteins (VLDL) and high-density lipoproteins (HDL) are increased (Phillips et al. 1996). This model differs from the P407 rat model, in which the increase in tri-glycerides is mainly attributed to the inhibition of endothelial LPL (Johnston and Palmer 1993). Obese Zucker rats are used as a model for type-2 diabetes mellitus. In the present study, the Zucker fatty rat model was used to investigate the characteristics of anti-hyperlipidemic and anti-diabetic effect of GP in this genetic model. In addition the effect of GP on sucrose and glucose tolerance was also investigated in Sprague-Dawley rats. Possible mechanisms of GP anti-hyperlipidemia and hypoglycemia are described using these models. Rattus norvegicus Zucker fatty rats were purchased from Monash University Melbourne Australia. The rats were male, 13-15 weeks old with an average weight of 300-380 g for the lean strain and 370-450 g for the obese strain. Sprague-Dawley rats were purchased from Animal Services at the University of Sydney. The rats were males 8-10 weeks old with average weight of 200-350 g. Animals were housed 3-4 per cage in a temperature-controlled (22 ± 1)°C room, with a light/dark cycle of 12 hr. For a week following their arrival, the animals were allowed free access to the standard rat chow diet and tap water while they were acclimating to the environment. During the experimentation all rats had ad libitum access to standard rat chow and water at all times unless otherwise stated in the Methods section. Rats were also monitored daily and cages cleaned twice weekly. At the start of the experiment animals were randomly distributed so that body weights, initial triglyceride (TG), total cholesterol (TC), , other parameters in all the experimental groups were similar. Treatments were administered to rats using oral gavage via a curved feeding needle (Harvard Apparatus). At the end of each study, animals were sacrificed and blood collected via cardiac puncture for analysis. Rats were sacrificed after the induction of anesthesia using 1 ml of ketamine injection (1 g /10 ml) followed by a lethal injection of 0.5 ml concentrated solution of potassium chloride (70%) directly into the heart. The protocols were approved by the Animal Ethics Committee of the University of Sydney. Purified gypenoside extract was provided by Ankang Pharmaceutical Institution of Beijing Medical University, People's Republic of China as a reference sample. GP extract containing more than 90 % gypenosides, was used for the experiments and was derived from a capsule formulation consisting of purified extract diluted to 30% with excipient (Ankang Pharmaceutical Institution of Beijing Medical University, People's Republic of China). The capsule formulation was placed in 90% ethanol, thoroughly mixed with a magnetic stirrer then filtered twice using filter paper and evaporated at 50˚C down to a solid in a Buchi Rotavapor R­114 over 24 hours. The extract was then dried in a vacuum oven and kept desiccated in a bell jar with silica gel. The resulting extract contained approximately 90% gypenosides. GP samples were well mixed in 1 % methylcellulose prior to administration to rats and administered using oral gavage. Olive oil was obtained from Goodman Fielder LTD (Sydney, NSW, Australia) with the following composition per 100 ml; energy 3400 KJ, fat 92 g, saturated fatty acids with a maximum of 20%, polyunsaturated fatty acids with a minimum of 5% and mono-unsaturated fatty acids with a minimum of 55%. Ethanol was obtained from Asia Pacific Specialty Chemicals Ltd. Sydney, Australia. Other materials including glucose, sucrose, ketamine hydrochloride, carboxymethylcellulose (CMC) and α -glucosidase, EC 3.2.1.20 (0.36 unit), were purchased from Sigma-Aldrich (Australia). Total cholesterol (TC), total triglyceride, (TG) low density lipoprotein cholesterol (LDL) and high density lipoprotein cholesterol (HDL) measuring kits were obtained from Sigma-Aldrich (Australia) and Trace Scientific Ltd.(Australia) and used according to the manufacturer’s instructions after processing as previously described (Megalli et al. 2005). The formation of glucose was determined by the glucose oxidase method using a commercial kit (Wako Pure Chemical, Osaka, Japan). In this procedure protein free filtrates prepared by the Somogyi technique using ZnS04/ BaS04 precipitation was used. (Somogyi 1952) All other reagents and chemicals were of analytical grade. To allow PreserveX™-QML to interact with natural membranes to form mixed micelles, PreserveX™-QML and fluorescently labeled membranes were combined in a 1.5-ml microtube in 0.5 ml HBS (total volume) at the appropriate protein/polymer ratio and briefly vortexed. If necessary, the mixture was sonicated briefly with a bath-type laboratory sonicator (VWR Model 75) at the maximum power setting (9) for 30 s at room temperature to complete dispersion. Immediately after sonication, the mixed micelle solution was dispensed into black 96-well microtiter plates (100 µl/well) for (Corning) fluorescence measurements. Various tissue samples were collected including: the proximal third of the thoracic aorta, cardiac muscle, liver, pancreas, lung, spleen and kidney. The collected tissues were placed immediately into 2% phosphate buffered glutaraldehyde and 8% formalin. They were trimmed of fat and connective tissue and 1 mm cross-sections obtained. After overnight fixing the samples were post-fixed in 1 % Os04, dehydrated and embedded in Epon. Non-perfusion-fixed tissue samples were no longer than 5 mm to allow uniform penetration of fixative. All tissues were evaluated using light microscopy by a veterinary pathologist in a blinded manner. Early atherogenesis was evaluated on the basis of endothelial damage, platelet and/or lipid adherence, subendothelial thickening and myofibroelastic and macrophage/monocyte infiltration of the intima. (Wu et al. 1985) The degree of atherosclerotic development in each aorta examined was independently blindly rated as normal, mild, moderate or severe. Other tissue samples were also evaluated using the same atherosclerotic pathological methodology. All data are expressed as the standard error of the mean (± SEM). Comparisons among the control and treatment groups were made using one-way analysis of variance followed by a Student-Newman-Keuls t-test using the Graph Pad Instat statistical program. With all analyses, an associated probability (P value) of less than 5% (P < 0.05) was considered significant. Effect of 4 day and 2-5 weeks treatment of obese and lean Zucker fatty rats with Gynostemma pentaphyllum (125 -250 mg/kg) on hyper-lipidemia in each strain, obese and lean rats were randomly divided into two groups, with 5 or 6 rats in each group. The control group received 1 % CMC by oral gavage daily for the duration of the experiment. The other groups received oral gavage of GP 125 or 250 mg/kg daily for the duration of the experiment. Blood was collected prior to starting the experiment, four days later to determine acute effects and then after either 2 weeks treatment or 5 weeks treatment in the GP 250 mg/kg group. At the end of the experiment samples of various organs were collected for pathological analysis. These organs included: aorta, heart, liver, kidney, spleen, and pancreas. Body weights were also measured prior to starting the experiment and prior to blood collection. In addition, following sacrifice rat livers were blotted dry on tissue, weighed and the ratios of liver weight to body weight was calculated. Effect of 3-5 week chronic treatment of obese and lean Zucker rats with Gynostemma pentaphyllum on post-prandial hypertriglyceridemia and hyperglycemia. The effect of GP on post-prandial hypertri-glyceridemia and hyperglycemia was examined in Zucker fatty rats given olive oil to produce an increased fat load and increase TG levels. This study was divided into 2 different arms, as follows: 3 week feeding: Obese Zucker fatty rats were fed GP 250 mg/kg by oral gavage for 3 weeks. Rats were then fasted for 18 hr, with free access to water. Rats were then divided into 2 groups, a control group receiving 1 % CMC by oral gavage or a group receiving GP 250 mg/kg by oral gavage. One hour later, rats were fed olive oil 5 mg/kg. Blood was collected 5 hr following olive oil administration and TG levels were determined. 5 week feeding: The same protocol described above was repeated after 5 weeks of treatment with GP 250 mg/kg by oral gavage. However, a higher dose of olive oil was used, 10 mg/kg and in addition blood was collected at 3 and 5 hr following olive oil administration. Effect of Gynostemma pentaphyllum on Glucose Tolerance in Sucrose-Loaded SD Rats. To examine the effect of GP on glucose levels following sucrose or glucose feeding in normal rats, Sprague-­Dawley (SD) rats were randomly divided into 4 groups and fasted for 20 hr before the commencement of the experiment. The groups were divided as follows: the naive control group received vehicle and then distilled water, and blood was collected at 30, 60 and 120 min. The positive control group received sucrose 1 g/kg PO and blood was collected at 30, 60 and 120 min. GP 125 mg/kg group, receiving both GP 125 mg/kg and sucrose simultaneously and blood collected over 120 min. GP 250 mg/kg group, receiving both GP 250 mg/kg and sucrose and blood collected at over120 min. Glucose was measured using a commercial kit (Wako Pure Chemical, Osaka, Japan) as described above. Effect of Gynostemma pentaphyllum on Glucose Tolerance in the Zucker Fatty Rat. A glucose tolerance test was conducted to investigate the effect of GP on insulin receptor sensitivity. In this experiment, 20 Zucker fatty rats, 10 from each strain (obese and lean), were divided into 2 groups, a control group and a treatment group receiving GP 250 mg/kg. Rats were fasted for 20 hr with free access to water. Rats were then given either GP 250 mg/kg or 1 % CMC by oral gavage. One hour later, all rats were fed glucose (2 g/kg) by oral gavage. Blood samples were collected prior to the start of the experiment, and 30 min and 120 min after glucose feeding. Plasma was then obtained and glucose levels determined. Effect of Gynostemma pentaphyllum on α-Glucosidase. Activity in vitro 200 µl of α–glucosidase was incubated for 5 min in the presence of 200 µ l of test sample solution (dissolved in DMSO, DMSO final concentration of 2%) or vehicle (2% DMSO). The reaction was started by the addition of 200 µl of 37 mM sucrose solution and terminated by heating at 90-100°C after 30 min. incubation at 37°C. Inhibition rates were calculated as percent of reduction of from a positive control without GP present and concentrations producing 50 % inhibition (IC50 values) were calculated from the concentration-inhibition curves by non-linear regression analysis as described previously. (Kurihara et al. 2003) Acarbose was used as a positive control (Gavin 2001; Kurihara et al. 2003). Comparison of lipid profiles between obese and lean Zucker fatty Rats. In the obese Zucker fatty rat, TG levels (2.9 ± 0.2 mmol/L) were significantly higher (72%) than in lean Zucker fatty rats (0.8 ± 0.1 mmol/L) under non-fasting conditions. In the obese Zucker fatty rat TC levels (3.4 ± 0.2 mmol/L) were significantly higher (51%) than lean Zucker fatty rats (1.7 ± 0.06 mmol/L) under non-fasting conditions. In the obese Zucker fatty rat LDL cholesterol levels (0.3 ± 0.02 mmol/L) were significantly lower (17%) than lean Zucker rats (0.4 ± 0.01 mmol/L) under non-fasting conditions. Obese Zucker fatty rat HDL cholesterol levels (1.6 ±0.2 mmol/L) were significantly higher (54%) than lean Zucker rats (0.8 ±0.06 mmol/L) under non-fasting conditions. Effect of 4 day treatment of obese Zucker fatty rats with Gynostemma pentaphyllum on hyperlipidemia. Acute 4 day treatment of obese Zucker rats with 125 mg/kg GP had no effect on TG levels However, at 2 weeks treatment with 125 mg/kg GP TG levels were significantly reduced by approximately 27% (from 3.9 ± 0.3 mmol/L to 2.8 ± 0.1 mmol/L). (Results not shown). Following 4 days of GP feeding of obese Zucker fatty rats at a dose of 250 mg/kg TG levels were reduced by 36% (from 3.6 ± 0.4 mmol/l to 2.3 ±0.2 mmol/L) (Fig.1a) . After 2 weeks of feeding, TG levels were significantly reduced by 33%, from 4.1 ± 0.4 mmol/L to 2.8 ± 0.3 mmol/L. At the end of the 5 weeks of feeding, TG levels were reduced significantly by 34%, from 3.7 ± 0.6 to 2.5 ± 0.4 mmol/L (Figure 1a). 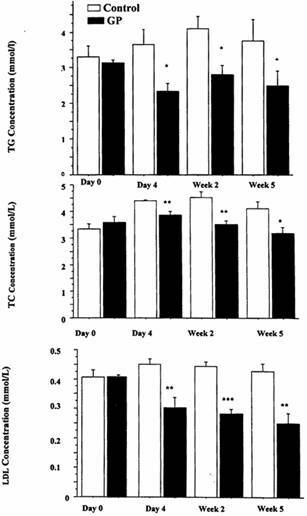 TC levels were reduced by 13% following 4 days of GP feeding of obese Zucker rats at a dose of 250 mg/kg, from 4.4 ± 0.04 mmol/L to 3.9 ±0.1 mmol/L (Fig.1b). Following 2 weeks of feeding, TC levels were reduced by 22%, from 4.5 ± 0.2 mmol/L to 3.5 ± 0.1 mmol/L. At the end of the 5 weeks of feeding, TC levels were significantly reduced by 22%, from 4.1 ± 0.3 to 3.2 ± 0.2 mmol/L. (Fig. 1b). LDL cholesterol levels were reduced by 33% following 4 days of GP feeding of obese Zucker rats at a dose of 250 mg/kg, from 0.5 ± 0.02 mmol/L to 0.3 ± 0.03 mmol/L (Fig.1c). Following 2 weeks of feeding, LDL cholesterol levels were significantly reduced by 36%, from 0.4 ± 0.02 mmol/L to 0.3 ± 0.02 mmol/L. At the end of the 5 weeks of feeding, LDL levels were reduced by 42%, from 0.4 ± 0.03 mmol/L to 0.3 ± 0.03 mmol/L. (Figure 1c). HDL levels were not affected in the GP-treated and non-treated groups during the period of the study, with levels remaining almost constant (average value of 1.5 mmol/L) (results not shown).There was no significant difference in weights of rats between groups treated with GP 250 mg/kg over the length of the study in both lean and obese strains (results not shown). After 5 weeks of GP 250 mg/kg feeding in both obese and lean Zucker rats, liver mass in the lean group was not changed. After 5 weeks of GP 250 mg/kg treatment in both obese and lean Zucker rats, liver to body weigh ratio in the lean group was not changed. A 10% reduction in liver to body weigh ratio occurred in the obese group, but this was not statistically significant. Effect of 3-5 week treatment with Gynostemma pentaphyllum on post-­prandial hypertriglyceridemia and hyperglycemia. The effect of chronic 3-5 week feeding GP on post-prandial hypertriglyceridemia induced by 5 mg/kg of olive oil was examined in Zucker fatty rats. Obese Zucker rats administered GP 250 mg/kg by oral gavage for 3 weeks significantly reduced blood TG levels by 37% (from 4.0 ± 0.3 mmol/L to 2.5 ± 0.1 mmol/L) 5 hr following olive oil administration. (Results not shown). In the control group, TG levels increased by 40%, whilst in the GP-fed group TG levels increased by 20%. (Data not shown). After 5 weeks of GP 250 mg/kg TG and glucose levels were measured 3 hr following administration of 10 mg/Kg of olive oil administration. Figure 1. Effect of single dose, 3 week and 5 week treatment of obese Zucker rats with Gynostemma pentaphyllum 250 mg/kg on hyperlipidemia. A Top Panel Total triglycerides. B. Middle Panel Total Cholesterol. C. Bottom Panel Low Density Lipoprotein cholesterol. N=5 for in each group, Mean ± SEM. *= P < 0.05, **= P< 0.005, ***= P< 0.0005 relative to untreated control at each time point. GP pre-treatment significantly reduced TG levels by 47%, from 4.6 ± 0.7 mmol/L to 2.4 ± 0.4 mmol/L. After 5 hr of administration of olive oil, GP pre-treatment significantly reduced TG levels by 18%, from 12.9 ± 0.03 mmol/L to 10.6 ±0.7 mmol/L. In the control group, TG levels increased by 70%, whilst in the GP fed group TG levels increased by 35% over the 5 hour test period. (Figure 2a) GP reduced glucose levels by 21%, from 9.0 ± 0.7 mmol/L to 7.1 ± 0.6 mmol/L. After 5 hr of administering olive oil, GP also reduced glucose levels by 21% from 10.3 ±0.03 mmol/L to 8.2 ± 0.5 mmol/L. (Figure 2b). Figure 2. Effect of 5 week pre-treatment of obese Zucker rat with Gynostemma pentaphyllum in post-prandial hypertriglyceridemia and hyperglycemia after 10 mg/kg of oral olive oil. A. Top Panel Plasma triglyceride (TG) levels B. Bottom Panel Plasma Glucose levels. N=5 for in each group, Mean ± SEM. *= P < 0.05 comparing treated with the control at the same time period using student t-test. Effect of Gynostemma pentaphyllum on glucose levels in sucrose-loaded Sprague-Dawley (S-D) Rats. The effect of GP on blood glucose levels in normal S-D rats fed sucrose 1 g/kg vs control (vehicle and water) was examined. at 30, 60 and 120 min. Following sucrose loading, in the control group, glucose levels significantly increased by approximately 25%. GP had no significant effect in lowering sucrose-induced hyperglycemia at 30, 60 or 120 min following sucrose loading at doses of GP of either 125 or 250 mg/kg [results not shown]. Effect of Gynostemma pentaphyllum in a glucose tolerance test in Zucker Rats. In the control obese Zucker fatty rat group, glucose levels increased from 6.1 ± 0.3 mmol/L to 15.7 ± 0.8 mmol/L after 30 min and 16.7± 0.5 mmol/l after 120 min. (Fig. 3A) In contrast, in the obese Zucker fatty rat group treated with GP 250 mg/kg , glucose levels increased from 6.2 ±0.2 mmol/L to 15.2 ± 1.4 mmol/L after 30 min and 13.4 ± 1.2 mmol/L after 120 min. Therefore, glucose levels in the control obese group rose by 174%, 120 min following glucose stimulation, whereas in the GP-treated rats, glucose level rose by only 114%. At 120 min, glucose levels were significantly (20%) less in the GP treated rats compared to the control group. (Figure 3A). In the control lean Zucker rat group glucose levels increased 33% from 5.3 ± 0.5 mmol/L to 7.9 ± 0.5 mmol/L after 30 min and 34% 8.1±0.6 mmol/L after 120 min. In contrast, in the lean Zucker rat group treated with GP 250 mg/kg, glucose levels increased from 5.9 ±0.3 mmol/L to 8.3 ± 0.2 mmol/L after 30 min and 7.6 ±0.3 mmol/L after 120 min. Therefore, glucose levels in the control group rose by 52% 2 hr following glucose stimulation, whereas in the GP -treated rats, glucose levels rose by 27%. However at 120 min glucose levels were not significantly different in the GP-treated rats group compared to the control group. (Figure 3B). Effect of Gynostemma pentaphyllum on α-glucosidase activity in Vitro. Despite the lack of significant effect of GP on postprandial hyperglycemia in Zucker fatty rats the effect of GP was investigated in vitro on a glucosidase activity. Acarbose, a positive control, caused a 50% inhibition of α-glucosidase activity at 53.9 µg/ml. (Figure 4a). By comparison GP caused a 50% inhibition of α-glucosidase activity at 42.8 µg/ml (Figure 4b). Pathological analysis of Rat Tissues following GP treatment. Lean and obese Zucker rats were divided into 2 groups, a control group receiving 1% CMC with an oral gavage every day for 5 weeks, and 250 mg/kg GP-treatment group by oral gavage daily for 5 weeks. Figure 3. Effect of Gynostemma pentaphyllum in a glucose tolerance test Zucker rats. A. Top Panel Obese Zucker Rats. B. Bottom Panel Lean Zucker Rats N=5 for in each group, Mean ± SEM. *= P < 0.05 comparing treated with the control at the same time period using student t-test. All aorta, heart, liver, kidney, lung, spleen and duodenum samples appeared to exhibit normal pathology in both control untreated and GP-treated lean Zucker rats. Pancreatic islets were smaller in number and slightly enlarged relative to normal S-D rat pancreatic islets in both groups. In control untreated obese Zucker rats all pancreatic islet samples showed severe enlargements with the presence of large vacuolated cells. Spleen, kidney and duodenum samples were normal. Liver samples showed severe hepato-cellular swelling and vascular changes in all rats. Oil Red O and VanGuessen stained heart samples showed normal endocardium and myocardium. Lung, spleen and duodenum samples were normal apart from small focal infiltration of cells. Interestingly, two aorta samples showed only mild endothelial vacuolation. Tunica media for all 5 rats were normal. In GP-treated obese Zucker fatty rats all pancreatic islet samples showed severe enlargements with the presence of large vacuolated cells. Spleen, kidney and colon samples were normal. One liver sample showed severe hepato-cellular swelling and vascular changes and the changes in the other four rats were moderate. All Oil Red O and VanGuessen stained heart samples showed normal endocardium and myocardium. All 5 Oil Red O and VanGuessen stained aorta samples were normal with no signs of endothelial vacuolation or any other pathological changes. Tunica media for all 5 rats were normal. The overall results are compared in Table 1. Figure 4. Effect of Gynostemma pentaphyllum on α-glucosidase activity in vitro A. Top Panel IC50 for acarbose is 53.9 μg/ml. B. Bottom Panel IC50 for GP is 42.8 μg/ml. Table 1. Comparison of pathological changes in control and Gynostemma pentaphyllum-250 mg/kg treated for 5 weeks in obese Zucker rats. In addition to numerous studies where the Zucker rat has been used as a diabetic model, various studies have utilized this model for hyperlipidemia studies of evaluation of anti-hyperlipidemic medications such as the HMG-CoA reductase inhibitors to elucidate the mechanisms of action of statin therapy. (Kaism et al. 1992; Georges et al. 1993) The obese Zucker rat, a genetically modified hyperlipidemic and diabetic rat, provides a suitable animal model to explore possible mechanisms of action of GP. Previous studies in China and traditional use suggest anti-hyperlipdemic properties of GP. The anti-hyperlipidemic properties of GP, previously determined from the poloxamer model (Megalli et al. 1005), were again confirmed in the obese Zucker rat model. At a dose of 250 mg/kg, GP significantly reduced both plasma triglyceride and total cholesterol levels in single doses and up to 5 weeks dosing. However the effect of GP was more profound in studies over a 5 week period of administration, which also demonstrated a significant reduction in LDL levels. The mechanism by which hypertriglyceridemia is induced in each of these models is, however, different. In the P407 model, triglycerides are mainly elevated via direct inhibition of LPL, thus reducing triglyceride degradation. However, in obese Zucker rats, hypersecretion of VLDL by the liver has been shown in liver perfusion, isolated liver cells and in vivo studies (Wang et al. 2003). Studies on obese Zucker fatty rats have shown the hyperlipiedemic state may be attributed to hypersecretion of hepatic VLDL and consequent saturation of the lipolytic removal of triglyceride-rich lipoproteins from the circulation (Wang et al. 2003). GP reduced triglyceride levels in both models; may be an indication that it acts on increasing LPL activity, hence increasing the degradation of triglycerides and/or reducing VLDL production in the liver. (Johnston and Palmer 1993; Megalli et al. 2005). The present studies also highlighted the significance of the dose-dependent effects of GP . In contrast to the 250 mg/kg dose a dose of 125 mg/kg of GP was not statistically effective in lowering either total cholesterol or triglyceride levels. The triglyceride-lowering effects of privastatin and atorvastatin were previously investigated in a Wistar rat model of post-prandial lipemia (Aoki et al. 2002). Increased triglyceride levels were achieved in 4 hr after a fat load using the meal supplement Clinimeal® emulsion, and reached a maximum at 6 hr. Both privastatin and atorvastatin were found to suppress the increase in plasma triglyceride. In this present model using Zucker rat where triglyceride levels were already elevated, pure olive oil was additionally used as a source of fat load. Following olive oil administration, in the control group TG levels increased by 70%, while in the GP-fed group TG levels increased by only 35%. Therefore, GP reduced the increase in triglyceride levels by 50%. A possible explanation of this reduction in triglyceride levels is that GP may suppress the secretion of chylomicron-triglyceride complexes into the lymph. In this study, marked pathological differences between lean and obese Zucker rat strains were also observed. The obese strain showed some pathological abnormalities in liver, pancreas, heart and aorta samples, compared to lean rats, which showed normal morphology. The effect of GP on tissue pathology was investigated. Tissue samples collected after 5 weeks of GP 250 mg/kg oral gavage treatment of obese Zucker rats demonstrated some positive protective findings. Firstly, liver samples in the non-treated group showed severe hepatocellular swelling and vascular changes compared to moderate changes in the GP treated group. This observation was supported by results showing a trend in reduction in both liver mass and liver to body weight mass in the treated group. The pathological findings further support previously published results, investigating the hepatoprotective activity of gypenosides (Kimura et al. 1983; Lin et al. 1992). Total gypenosides reduced serum levels of R-glutamine transaminase as well as hepatic lipid peroxide in rats with liver damage as a result of hyperlipidemia achieved by a high fat diet (Kimura et al. 1983). Secondly, aorta and heart samples obtained for GP 250 mg/kg-treated rats displayed normal morphology compared to those obtained from non-treated rats. By contrast, some aortas obtained from non-treated rats showed mild and moderate vacuolation of cells. While these pathological observations are only qualitative; in light of these findings the possible cardioprotective GP properties require further investigation. It should also be noted that no pathological differences were observed in either treated or non-treated groups in pancreas, spleen, kidney and duodenum samples. In addition, no pathological differences were noted in GP- treated or non-treated groups in lean Zucker rats. Obese Zucker rats were employed to investigate the effect of GP on lipid metabolism. However, an effect of GP on anti-diabetic activity was observed during the course of these studies. Reductions in glucose levels in GP-fed obese Zucker rats were observed. A glucose tolerance test was used to indicate the response of insulin receptors to the elevation of exogenous glucose thus serving as a measure of sensitivity of insulin receptors to a glucose load. In the obese Zucker rat, the sensitivity of insulin receptors to glucose is significantly reduced (Lee et al. 1997). Therefore, it is a suitable animal model to test xenobiotics which may potentially improve sensitivity to insulin receptors. Obese Zucker rats were very sensitive to exogenous glucose-induced hyperglycemia. Following glucose feeding to obese Zucker rats, glucose levels were increased by approximately 174%, however, lean Zucker rats displayed less sensitivity to the exogenous glucose-induced hyperglycemic effect, glucose levels increased by approximately 52% following glucose feeding at both time intervals. Interestingly, GP was found to be effective in significantly reducing glucose levels by 20% compared to treated and non-treated rats in the obese strain at the 120 min interval. 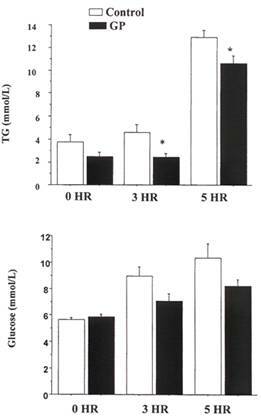 In a rat with a normal homeostatic response to glucose, stimulation with exogenous glucose is expected to raise glucose levels at both the 30 min and 120 min period. Improvement of insulin sensitivity by drug treatment is expected to lower glucose levels at 120 min relative to 30 min relative to the untreated control. No significant reduction in glucose levels at 120 min was achieved by GP 250 mg/kg treatment in the lean strain, in contrast to the 20% decrease seen in the obese rat. GP may improve the sensitivity of insulin receptors to exogenous glucose in the obese Zucker rats. The lack of effect found in the lean strain could indicate that GP may not produce a hypoglycemic effect in situations of normal blood glucose regulation. This pharmacodynamic effect of GP has not reported in previous studies. To further investigate these findings, the effect of GP on glucose levels in sucrose-loaded SD rats was also studied. GP was found to have no effect on reducing glucose levels relative to untreated controls in this model. This suggests a lack of gastric emptying effect of GP, as increased gastric emptying of sucrose would lower glucose absorption. Our findings suggest effects of GP on the digestion of sucrose by α-glucosidase activity in the small intestine in vivo are unlikely. α-glucosidase is a disaccharide-degrading enzyme in the small intestinal mucosa and α-glucosidase inhibitors cause a decrease in the absorption and digestion of glucose into the blood with subsequent lowering of the blood glucose level (Gavin 2001). The effect of GP on α-glucosidase activity was also examined in an in vitro study, where GP was found to have an inhibitory effect on α-glucosidase activity. In addition, these results may also suggest that the combination of gypenosides at these doses studied may have no direct effect on the secretion of insulin, as glucose levels were not significantly reduced in the sucrose-loaded S-D rat model, as well as in the lean strain of the Zucker rat in the glucose tolerance test. Nevertheless, it should be noted that the present results were obtained after single dose treatment, whereas 3-5 week treatment to steady state may have provided different results. Previous studies have suggested that phanoside isolated from Gynostemma pentaphyllum has insulin secreting effects in Wistar rats (Norberg et al. 2004). In conclusion, the present studies were able to demonstrate an anti-hyperlipidemic effect of GP in the Zucker rat model, where it possibly acts by inhibiting VLDL production. Also, the results obtained do not exclude an intestinal site of action of GP, where it may act by suppressing the secretion of chylomicron-triglyceride complexes into the lymph. In addition, pathological examinations of GP suggest which cardioprotective and hepatoprotective properties should be further evaluated. The present studies were also able to demonstrate a potential new effect of GP in diabetes, where the results obtained in obese Zucker rats were consistent with increased insulin receptor sensitivity by GP, as demonstrated by the glucose tolerance test. Given these positive results and promising chronic toxicological evaluation in rodents (Attawish et al. 2004) human clinical trials have been initiated. (Chou et al. 2006). Aktan F, Henness S, Roufogalis BD, Ammit AJ. 2003. Gypenosides derived from Gynostemma pentaphyllum suppress NO synthesis in murine macrophages by inhibiting iNOS enzymatic activity and attenuating NF-kappaB-mediated iNOS protein expression. Nitric Oxide. 8: 235-242. Attawish A, Chivapat S, Phadungpat S, Bansiddhi J, Techadamrongsin Y, Mitrijit O, Chaorai B, Chavalittumrong P. 2004 Chronic toxicity of Gynostemma pentaphyllum. Fitoterapia. 75: 539-551. Aoki T, Yoshinaka Y, Yamazaki H, Tamaki T, Sato F, Kitahara M, Saito Y. 2002. Triglyceride lowering effect of pitvastatin in a rat model of postprandial lipemia. Eur J Pharmcol 444:107-113. Durate J, Martinez A, Bermejo A, Vera B, Gamez M, Cabo P, Zarzuleo A. 1999. Cardiovascular effects of captopril and enalapril in obese Zucker rats. Eur J Pharmcol 365: 225-232. Gavin J. 2001. Pathophysiologic mechanisms of postprandial hyperglycemia. Am J Card 881: 4-8. Georges B, Blond JP, Maniongui C, Bezard J.1993. Effect of simvastatin on desaturase activities in liver from lean and obese Zucker rats. Lipids. 28: 63-65. Huang TH, Razmovski-Naumovski V, Salam NK, Duke RK, Tran VH, Duke CC, Roufogalis BD. 2005. A novel LXR-alpha activator identified from the natural product Gynostemma pentaphyllum. Biochem Pharmacol. 70: 1298-1308. Huang TH, Li Y, Razmovski-Naumovsi V, Tran VH, Li GQ, Duke CC, Roufogalis BD 2006 Gypenoside XLIX isolated from Gynostemma pentaphyllum inhibits nuclear factor-kappa p activation via a PPAR-alpha-dependent pathway. J Biomed Sci 13: 535-548. Johnston T, Plamer W. 1993. Mechanism of Poloxamer induced hypertriglyeridemia in rat. Biochem Pharmcol 46: 1037-1042. Kasim SE, LeBoeuf RC, Khilnani S, Tallapaka L, Dayananda D, Jen KL. 1992. Mechanisms of triglyceride-lowering effect of an HMG-CoA reductase inhibitor in a hypertriglyceridemic animal model, the Zucker obese rat. J Lipid Res. 33: 1-7. Kimura Y, Okuda H, Arichi S, Takemoto T. 1983. Effects of crude Gynostemma pentaphyllum on lipid metabolism. Shoyakugaku Zasshi 37: 272-275. Kurihara H, Fukami H, Kusumoto A, Toyoda Y, Shibata H, Matsui Y, Asami S, Tanaka T. 2003. Hypoglycemic action of Cyclocarya paliurus (Batal.) Iljinskaja in normal and diabetic mice. Biosci Biotechnol Biochem 67: 877-880. Lee Y, Hirose H, Zohu Y, Esser V, McGarry J, Unger R. 1997. Increased lipogenic capacity of the islets of obese rats: a role in the pathogenesis of NIDDM. Diabetes 46: 408: 413. Lin J, Lin C, Chiu H, Yang J, Lee S. 1992. Evaluation of the antfnflammatory and liver-protective effects of Anoectochilus formosanus, Ganoderma lucidum and Gynostemma pentaphyllum in rats. Am J Chin Med 21:59-69. Megalli S, Aktan F, Davies NM, Roufogalis BD. 2005. Phytopreventative anti-hyperlipidemic effects of gynostemma pentaphyllum in rats. J Pharm Pharm Sci. 8: 507-515. Norberg A, Hoa NK, Liepinsh E, Van Phan D, Thuan ND, Jornvall H, Sillard R, Ostenson CG. 2004. A novel insulin-releasing substance, phanoside, from the plant Gynostemma pentaphyllum. J Biol Chem. 279: 41361-41267. Phillips M, Liu Q, Hammond H, Dugan V, Hey P, Caskey C, Hess J. 1996. Leptin receptor missense mutation in the fatty Zucker rat. Nat Genet 13:18-19. Somogyi M. Notes on sugar determination. 1952 J Biol Chem. 195: 19-23. Wang Y, Jones P, Pischel I, Fairow C. 2003. Effects of policosanols and phytosterols on lipid levels and cholesterol biosynthesis in hamsters. Lipids 38:165-170. Wu JX, Maes L, Andries R, Warson F, Gepts W, Bourgain RH. 1985. Early morphologic changes in coronary arteries of experimental diabetic rats. Acta Diabetol Lat. 1985;22: 317-326. Zhang Z, Xie Huang SJ,1993. Analysis of medicinal and nutritional components in Gynostemma penthaphyllum. Shanxi Daxue Xuebao Ziran Kexueban. 16: 307-310. Zhou HP. 1988. The saponin constituents and pharmacology of Gynostemma pentaphyllum Makino Bull Pharm 23: 720-724. Published by the Canadian Society for Pharmaceutical Sciences. Copyright © 1998 by the Canadian Society for Pharmaceutical Sciences.